Surgery scheduled in May or June ! The examination lasted until about 2:00 pm as pre-surgery tests and x-rays were completed on her back, breathing capacity determined, flexibility measured and other pre-operation tests completed. 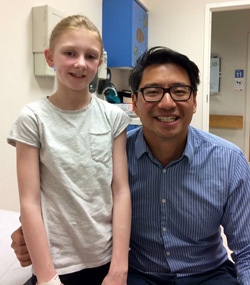 Dr. Whang then reported that Mega has been ACCEPTED into the Vertebral Body Tethering (VBT) surgical program for treating her scoliosis (note we had previously reported Megan had spina bifida, which is NOT correct). A VBT surgery elastic band that goes into her back will be installed during surgery and this will help to straighten her spine as she grows older. This is in lieu of metal rods being placed in her back which was the older technology, albeit the rods may be necessary if the elastic ban treatment is not successful (unlikely). Megan will need a wheel chair after her surgery for a week or so. Ted Trevorrow, who leads our Rotary District’s “Project CURE” initiative will easily be able to obtain the wheelchair. 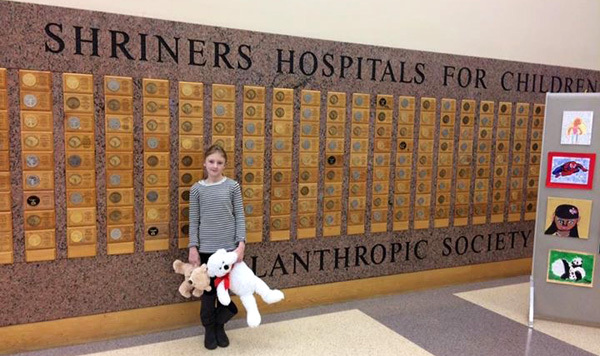 Megan will not know the actual surgery data Shriners Hospital until about 30 days from now, although it is expected to be scheduled in May or June…. the sooner the better as she continues to grow, causing additional spine curvature. Once surgery is completed, she is expected to be in the hospital for post-op recovery for 1-2 weeks at which time she will be dismissed. They DO want her nearby for an additional 2 weeks, just to keep monitoring her progress. Thereafter, she will be able to go home to Wales and not return for hopefully a year. Ted Trevorrow is investigating Megan’s family housing situation during her return trip for surgery. The Ronald McDonald House is a probable opportunity; however, we won’t know for sure about the Ronald McDonald House’s availability until 24 hours before the surgery. In addition, after Megan is out of the hospital, the family must leave the Ronald McDonald House and find alternate housing for the family of 2 adults and 3 girl children during her post-op, non-hospital portion of her recovery. For the remainder of her trip here in Philadelphia this week…..
Wednesday they sort of chilled out and went to the Cherry Hill mall to hangout (very American of them!). Thursday, they will be seeing local friends. Friday, Ted and Sally Trevorrow will take them to the Franklin Institute to see the dinosaurs. (VERY COOL exhibit according to Grandpa and DG Dave who took his grandkids a couple of weeks. Rotarian Ted has been wanting to see the exhibit anyway, he was just afraid to see it all by himself, it’s pretty scary). Saturday and Sunday are t.b.d. The family returns on Monday evening where Megan’s Father Philip needs to return to his job as a “Constable” at the Dyfed Powys Police Department in Wales. Megan just wants to return to school, her gymnastic classes and her friends. Watch The ABC News Team In Philly broadcast the same night as Megan and her family arrived. It was on the news even before they got to their hotel room ! 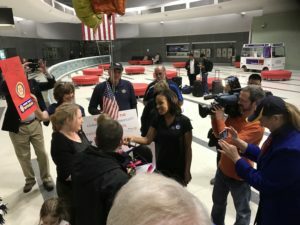 0+ Rotary Members from Rotary District 7450 (Philadelphia Area) greeted Megan, Mom (Laura), Dad (Philip) and sisters Isabelle and Kaci as they arrived safely and a bit weary after a long flight from London, Heathrow. 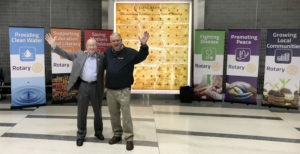 Governor Dave and “Megan Adventure” Project Chair Ted set up a Rotary “Areas of Focus Display” surrounding a large display of the US Constitution (VERY COOL!). The Philadelphia ABC News Team with reporter Jeannette Rehas interviews Ted Trevorrow before Megan arrives and then interviews Megan and family when they arrive. Rotary hired a van to take everyone to the hotel with LOTS of luggage and lots of new toys, gifts and food from Rotary members. 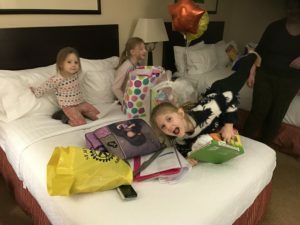 Finally, everyone gets checked into the hotel and the girls are jumping on the bed, glad to get some sleep for the next step in “Megan’s Adventure”. of their arrival into Philadelphia. 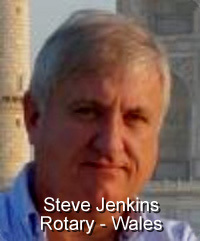 On February 14, Dave Haradon, Rotary International’s District 7450 Governor for the Philadelphia area, received an email from fellow Rotary District Governor Steven Jenkins of Rotary District 1150 located in Southern Wales, United Kingdom (England). He asked if our Rotary District 7450, located around the Philadelphia area, could help support a family that was coming from his Wales Rotary District to Philadelphia …this Sunday, February 19 !“Sure, we’re Rotary! We’re EXTRAORDINARY! What can we do to help (gulp)?”, I said, having no idea what this was all about. 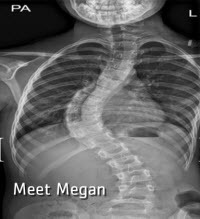 It turns out that a 10-year-old girl named Megan has spina bifida, a birth defect caused by an incomplete closing of the backbone and membranes around the spinal cord. Meet Mega as shown via her X-ray picture (shared with her mother’s permission). Megan needs an operation called “Vertebral Body Tethering” (VBT), which is NOT available in the United Kingdom. VBT is a better way of treating scoliosis spina bifida for young patients with moderate to large curves and adolescent growth left. This innovative, less invasive, surgical procedure can modulate bone growth of the spine during rapid growth spurt periods when adolescent spinal curvatures typically progress so much! Shriner’s Hospital in Philadelphia uniquely performs this surgery. Megan’s family is coming here for pre-testing and possibly to have the actual operation, although this remains to be determined. Megan’s first appointment is at Shriners Hospital this Tuesday, February 21st at 10:30 am. Early last Thursday morning, at the Kennett Starbucks, having coffee with my good friend Ted Trevorrow, I casually mentioned the situation to my fellow Longwood Rotarian. I asked for his ideas about how we could address this situation. Without hesitation, Ted said…” I’ll take care of it !! !” And he has…. In an online GoToMeeting with DG Dave (Philadelphia) and DG Steve (Wales) and myself, we found out the details of “Megan’s Adventure” including family, air flight, hotel, hospital, doctor, transportation, phone details, etc. Can you imagine the confusion, fatigue, sense of being overwhelmed upon arrival all alone at PHL with 3 kids and the luggage that goes with them? 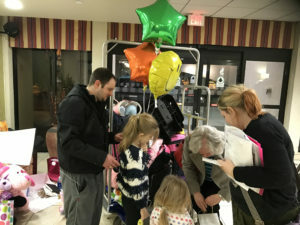 How do you get from the airport to the inexpensive Cherry Hill Holiday Inn — where they booked a reservation to save some money — with a 4-year-old child in the middle of the night? Will their UK cell phone even work to call Uber? What are the travel challenges and expensees getting from NJ to Philly? Are they prepared for the $50 trip? Uber is a good plan, but what if Uber is unavailable, or very slow? Megan and family will arrive at 8:30pm after a long flight from Heathrow Airport to Philadelphia, arriving in Terminal A on Ibera Airlines Flight 4607 this Sunday, February 19th. We can help these folks out. As DG Dave Haradon put it, “Let’s wrap our arms around this family”! The first order of business is a smiling Philadelphia Rotary Welcome as they emerge from customs. That should go a long way towards easing their concerns. A few signs, American Flags, Union Jacks and a funny hat or two should do the trick. Their flight, IB4607, gets into Terminal A at 8:25 pm Sunday evening. We can all gather at about 8:30 pm at baggage claim! Who can make it?! DG Dave and I will be there! It may be a bit “inconvenient” on a Sunday evening, but just think what this “Service Above Self” effort will mean in the hearts of Megan and her family. They are already wowed by what the Shriners doctors are doing for them. Let’s give them a dose of good old Yankee Doodle hospitality! Please email Ted Trevorrow, etd750@verizon.net. Let me know that you can join us at the airport to greet these folks. If you can make a sign welcoming them by name, or have a flag, USA and/or UK, let me know that too. We’ll want to have some cold-water bottles and some crackers or cookies (biscuits to the Brits.) I’m looking forward to hearing from you! DG Dave and I will be driving to the hotel with the family to make sure they get checked in. Arrangements have been made to transport them and their luggage to the hotel and the hotel has confirmed their reservation and all the details. Any volunteers there would be very much appreciated. So, who can join in to help make life better for a little girl and her family at a time when help is needed in so many ways? 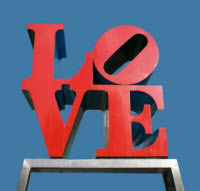 THANKS in advance for being a Rotarian and for possibly JOINING US Sunday evening at PHL airport. Error: Error validating access token: Session has expired on Friday, 01-Mar-19 13:00:41 PST. The current time is Wednesday, 24-Apr-19 21:31:12 PDT.